SERMON given at the annual Mass of the Society of King Charles the Martyr, Church of the Resurrection, New York, 31 January 2015, by The Rev'd Canon Barry E. B. Swain, SSC. 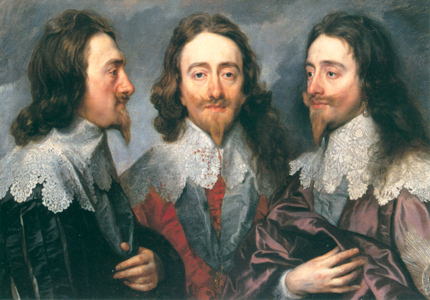 On a very cold and blustery day, the penultimate day of January, AD 1649, Charles I, King of England, Scotland, and Ireland, brought down the final curtain on a drama which had been in progress since the death of his father, King James I, in 1625. Queen Henrietta Maria was away in her native France, interceding for him with her sister-in-law, Anne of Austria, who was serving as Regent of France for her minor son, Louis XIV, though it was Cardinal Mazarin who held sway. France, however, was caught in the throes of its own civil war, the Fronde, and though perhaps Louis XIII (had he still been alive) would have aided his sister and brother-in-law, Cardinal Mazarin thought it unnecessary. The King’s son and heir, the Prince of Wales, known to history as Charles II, had fled to the Hague and was taking refuge there with his sister, Mary, the Princess of Orange. The King did have his daughter Elizabeth with him, who was herself destined to live only a year more, dying of what was described as pleurisy but was generally thought to be a broken heart. On the scaffold, the King conducted himself in such a way that even many who had advocated the overthrow of the monarchy, and even those who had signed his death warrant, were in silent admiration. The King had carefully worn two undershirts so that none would think he was shivering from fear and not, as he knew he would be in truth, from the cold. Sirs, My Conscience in Religion, I think, is very well knowne to all the World; and, therefore, I declare before you all that I die a Christian, according to the profession of the Church of ENGLAND, as I found it left me by my father. And this honest man [pointing to Dr. Juxon, the Bishop of London] I think will witness it. [Then turning to the Officers said,] Sirs, excuse me for this same. I have a good Cause, and I have a gracious God; I will say no more. There is but one Stage more, Sire. This Stage is turbulent and troublesome; it is a short one: But You may consider it will soon carry You a very great way; it will carry You from Earth to Heaven; and there you shall finde a great deal of Cordial Joy and Comfort. I go from a corruptible, to an incorruptible Crown; where no disturbance can be, no disturbance in the World. I suppose very few could hear that story and not be moved. Even the blackest heart of an Anglophobe or worse still a member of the Labour Party might just be touched. It is REMEMBRANCE that we begin with to-day, the first of three concerns we have, and by Remembrance, I do not mean learning our history (though that is more and more a frantic concern with the state of education in the western world). I mean instead REMEMBRANCE in the technical, liturgical sense. There is a word for this in Greek – ἀνάμνησις – and as my parishioners know, I rarely make reference to ancient languages or the ancient world as I once made my living teaching them, and there is nothing so tedious or self-important as an ex-classicist. But this time turn to the Greek we must, for this word has a technical and liturgical meaning that is at the heart of the Catholic Faith and the Mass itself – "τοῦτο ποιεῖτε εἰς τὴν ἐμὴν ἀνάμνησιν" – Do this in Remembrance of me. Those words we hear Sunday by Sunday, and some of us even day by day. It is those words, which by themselves, uttered by one who has himself been ordained a Catholic priest, annihilate time and space, for God is not servant of those but their Master, and those words send us back to the Last Supper and that action with his disciples, and his sacrificial offering on the Cross the next day which completed that same action. “Remembrance” in this sense is no mere nostalgia, no recollection. Proust famously tasted a Madeleine, dipped in tea, which inspired an involuntary memory and which led to a torrent of millions of words in French which no human being has ever been able to read entirely. No, the Remembrance we allude to is the remembrance, anamnesis if you prefer, that puts us back in that time and place just as surely as if we had been whisked there by H. G. Wells’ time machine. At every Mass, these words are uttered and suddenly we no longer kneel in a church in New York or New Delhi, Boston or Bombay, Chicago or Shanghai, Virginia or Vienna, but instead we kneel at that sacred meal, the shadow of the Cross looming, and it is not I, a sad excuse for a priest whose little treasure is hid in an earthen vessel, who pronounces these words, but Christ Himself. And of course it is our belief, absolutely central to the Faith, that those words are not themselves a pious recollection but in fact a dynamic unleashing of the Holy Ghost which then makes of Bread and Wine his own Body and Blood. It is that kind of remembrance to which we allude. When we speak of the Saints, that kind of Remembrance whisks us away from our quotidian world, whether it be a life of virtue or vice, calm or tempestuous, exemplary or tawdry, or more likely all mixed up as it is with most of us, it places us at one with the Saint whose example we Remember. When King Charles said that one word, he did not mean to remember himself, a mortal man, about to lose his life, a King who had made mistakes and misjudgments, a husband who had taken quite a while to appreciate his wife, a Father not always patient with his many children, or a soldier with very little tactical ability. He meant instead to remember what he had now learnt and was about to display, that the incorruptible crown was far more important than the corruptible. The Civil War, the ungodly and totalitarian “Commonwealth” period, and ultimately the so-called “Glorious Revolution” let loose a kind of Pandora’s box of forces which would end in the 20th century by obliterating much of the Faith, Culture and way of life of Europe. Twice more this same drama would be repeated, the protagonists not remembering the English example, and the victims prepared to offer themselves, trusting absolutely in God, and perhaps oddly enough or not so oddly, both the others read the account of the last days and execution of King Charles. Almost 144 years to the very day, this same drama was acted out, in a way so similar it was almost uncanny. Louis XVI, the Most Christian King of France and Navarre, was beheaded by the guillotine before a mob of Parisians, just as King Charles had been beheaded by the axman before a mob of Londoners. Louis was a kind husband, who had also persevered in a difficult marriage of which they made eventually a great success, a loving father, and a King who in ordinary times would have made quite a satisfactory sovereign. He had, however, like Charles I, the misfortune of living in times that were anything but ordinary, and his best was not judged to be good enough. Showing the same dignity, recollection and Christian piety shown by King Charles, on Monday, 21 January 1793, Louis XVI was beheaded by guillotine in the Place de la Révolution, formerly known as the Place Louis XV, and now the Place de la Concorde. The executioner, Charles-Henri Sanson, testified that the former king had bravely met his fate, in a way that astonished him, a convinced republican. As Louis XVI mounted the scaffold, he appeared dignified and resigned. He delivered a short speech in which he reasserted his innocence ("I pardon those who are the cause of my death....") He declared himself innocent of the crimes he was accused of, praying that his blood would not fall back on France. He alluded to only one of the quarrels between himself and the new regime: their insistence that the French clergy abjure their ordination vows and swear fealty to the French Republic rather than to the Holy See. Many accounts suggest Louis XVI's desire to say more, but Antoine-Joseph Santerre, a general in the National Guard, halted the speech by ordering a drum roll. The King was then quickly beheaded. Neither his Queen, Marie Antoinette, nor his son and heir the Dauphin, now Louis XVII, were with him, both being imprisoned and unaware of his fate. At a time when moral decay had taken its toll on France, and nowhere more so than the court it often seemed, King Louis XVI was a man of devout faith. He never took a mistress, never shirked his religious duties, genuinely preferred work to frivolous parties and truly saw his kingship as a sacred duty rather than an opportunity to have the best for himself. All of that is well established and should be well known. So what strikes us most with this comparison? That when all was said and done, as with Charles I, the matter at hand was fidelity to God and His Church. But this was not the last chapter of remembrance, for though we have considered the Anglican Royal Martyr and the Roman Catholic Royal Martyr, we have yet to come to the Orthodox. I refer of course to the Tsar Martyr, Nicholas II. By Yurovsky (the chief executioner’s) account in the early hours of 17 July 1918, just under a century ago, the Imperial family were awakened around 2:00 am, told to dress, and led down into a half-basement room at the back of the Ipatiev house. The pretext for this move was the family's safety—that anti-Bolshevik forces were approaching Ekaterinburg, and the house might be fired upon. A firing squad had been assembled and was waiting in an adjoining room. Nicholas was carrying his son; when the family arrived in the basement, the Empress wondered if chairs could be brought in, as her heart condition and the Tsarevitch’s haemophilia did not permit them to stand very long. Yurovsky ordered two chairs brought in, and when the Empress and the Tsarevitch were seated, the executioners filed into the room. Yurovsky announced to them that they had been condemned to death by the Ural Soviet of Workers' Deputies. A stunned Nicholas asked, "What?" and turned toward his family. Yurovsky quickly repeated the order and shot the Emperor as he and his family uniformly made the sign of the Cross. The executioners drew revolvers and the shooting began. Nicholas was the first to die; Yurovsky shot him several times in the chest. Olga, Tatiana, Marie and Anastasia survived the first hail of bullets; the Grand Duchesses were wearing over 1.3 kilograms of diamonds and precious gems sewn into their clothing, which provided some initial protection from the bayonets and bullets, which then wildly ricocheted. They were stabbed with bayonets and then shot at close range in the head. When the bodies were dumped down an abandoned mine shaft, a caustic solution was poured over them, which the regicides hoped would dissolve their remains. It did not. Now the Russian Revolution was exceedingly complex, and to dilate on its causes, twists and turns would take all day. One thing is germane to our consideration to-day, however, and that is this. Colouring every single action ever taken by the Tsar, was his absolute belief that as the anointed Sovereign, he had made a vow to God and the Russian people to serve them as Tsar. He had never wanted to be Tsar, and was ill suited to the position, which he did not relish, and which the Empress relished even less. No matter what happened, however, the guiding light of his life was God and His Church and his vocation, to be the anointed Father of his people. It was that which led him to the “House of Special Purpose”. In 1917 Metropolitan Makarios of Moscow saw in a vision the Saviour speaking to Tsar Nicholas: "You see," said the Lord, "two cups in my hands: one is bitter for your people, and the other is sweet for you." In the vision the Tsar begged for the bitter cup. The Saviour then took a large glowing coal from the cup and put it in the Tsar's hands. The Tsar's whole body then began to grow light, until he was shining like a radiant spirit. Then the vision changed to a field of flowers, in the middle of which Nicholas was distributing manna to a multitude of people. A voice spoke: "The Tsar has taken the guilt of the Russian people upon himself and the Russian people is forgiven." Nicholas himself once said: "Perhaps an expiatory sacrifice is needed for Russia's salvation. I will be that sacrifice. May God's will be done!" Nicholas II had a very strong sense of his destiny as an Orthodox ruler. Although he had an opportunity to flee the country with his family and seek refuge outside Russia, he and his Empress deliberately chose to stay and accept whatever awaited them. He had been born on the feast of the Prophet Job and because of this he often remarked to his advisors: "I have a secret conviction that I am destined for a terrible trial, that I shall not receive my reward on this earth." With your five renowned and godly children of blessed fame. O passion–bearers decked in purple, intercede for us. This, of course, could be said of all three. Is it a coincidence, I wonder, that God has provided each branch of the church, Roman Catholic, Anglican and Orthodox with a royal martyr of its own? Our second consideration is a simple one, but important. My most distinguished predecessor, Bishop Chambers, was Rector of this church from 1949 to 1962, and then Bishop of Springfield, Illinois, for ten years. His portrait hangs in the building next door, and a plaque on its front commemorates its name and his. I met him only a few times in his old age, and he was like an ancient patriarch. But in his day, he was regarded as a powerhouse, and like many priests of his day, was both respected and a bit feared, unlike to-day when so many of us are neither! Whenever a parishioner or a hapless visitor would make the oft-made but well-meaning comment, “What a good sermon, Father,” Bishop Chambers would remark briskly but pointedly, “See that you profit by it, my child.” I suspect this remark was more than a bit tongue in cheek, and also slightly from exasperation as you would be surprised how often people make that comment who could not mention one single point of the sermon if asked. In any case, his answer was our second point. Once we “remember”, we profit by it. Remembrance puts us at one with the Saint in question, that kind of liturgical remembrance is a grace from God which obliterates time and space and allies us with the saint, and he or she is bound to us also. When we “remember”, two consequences flow. The first is that we profit by it. We profit by their example, we read the stories of their lives, of their fortitude, of their bravery, of their piety, of their fidelity, and the more we read, the more we wonder how our lives compare to theirs. So often that comparison leaves us feeling overwhelmed, as we have neither profited by their example nor been instructed by their penitence. It is then, however, that we realise, perhaps suddenly, perhaps gradually, what God intends for us to realise: that we are to profit by their example not by reproaching ourselves for the past, that is what the Sacrament of Penance takes care of. We are to profit by their example by making a new start. When we have a special devotion to a saint, perhaps especially to a martyr, we ask him or her to inspire within us a measure of that devotion which so vehemently enkindled their hearts. And for this, we must assent to God. The heart that is closed to the Holy Ghost remains cold, lonely and sad. But when the heart is open to the Holy Ghost, it is vehemently enkindled with love, rejoices in the companionship with God and His Saints, and dances with joy, and burns like a furnace of charity just as Our Lord’s Sacred Heart does. God can and does work wonders with us, and often the only thing lacking is our invitation to him to do so. If the Saints furnish us with examples which inspire, our response must be to profit by them, and try to make their best virtues our own, even in a small way. Remembrance. Profiting by example. And our final point is Intercession. If the saints were simply cardboard figures in textbooks they would be no different to any other impressive people in history: Queen Victoria, Sir Winston Churchill, the Duke of Wellington, Lord Nelson, Napoleon, Frederick the Great, George Washington and Abraham Lincoln in public life; Fra Angelico, Raphael or El Greco in painting, the great sculptors Michelangelo and Bernini, musical giants like Bach, Mozart, Wagner, Verdi or our composer to-day, Papa Haydn, or the literary greats such as Chaucer, Shakespeare, Milton, Keats, Dickens and of course I must mention T. S. Eliot and Rose Macaulay, members of our Society. No, the saints are more than this. They are those who have won the race and fought the fight, they have gained that incorruptible crown. In many cases, they scorned what the world thought important, and fixed their eyes on things above. Their intercession is powerful with God because their example is powerful and because they are close now to his throne of glory in Heaven, whereas we are far from it, and sometimes lose hope of ever reaching. We have given you two nice pictures of the Royal Martyr in to-day’s service paper. We could have used a third. 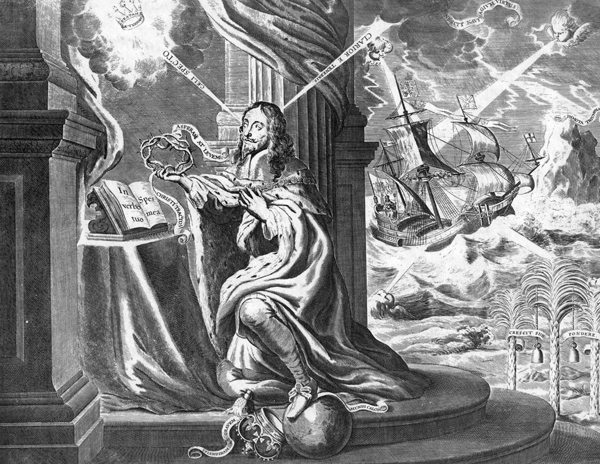 You will know it, of course, it is the frontispiece from Eikon Basilike, which shows the King kneeling and praying. His eye goes beyond the world to the throne of God above, the golden crown of St Edward placed on his head in 1625 in Westminster Abbey has been cast aside as so much dross, and his vision is shown fixed on a heavenly crown. At his side are the Holy Scriptures and a volume labelled the Tradition of the Church. But his vision is shown also going to another place – to a representation of his people still in the world, going about their lives, his eye is still on them not because they are his goal, but because they are still his concern. Even as he prepares to be admitted to heaven as saint and martyr, he still bears in his heart the love of his people he leaves behind, the people he vowed to govern in God’s name. Each of our Royal Martyrs we have thought of to-day has that same thing in common: each could have bettered his lot, and saved his life and perhaps even his crown by selling God short and forgetting their obligation to their people, and each, either in speeches before their death, or in writing before their death in letters to their families, made plain that they intended to make a witness to these points even unto death. Two of our royal martyrs are canonised, one alas, is not yet. But let us be quite clear, no matter what system of government we live under, no matter how good or poor we judge these kings to have been, no matter what mistakes they made, no matter what earthly effect their examples had, none of these things matters. For it is not for any of these things that we venerate them. We do so because they offered their lives in meekness and Christian humility before injustice, calumny, blackmail, threats and terrorism. They offered their lives for their people as a ransom, willingly, and in the example of Christ, their Master. We Remember. We Profit by their Example. We beg their Intercession.